Come Support the Fight to End Homelessness!!! Eat Delicious Pizza!!! The Wall is a newspaper to educate and raise awareness about homelessness. We need YOUR SUPPORT to print our paper! EAT IN, PICK UP, OR DELIVER! 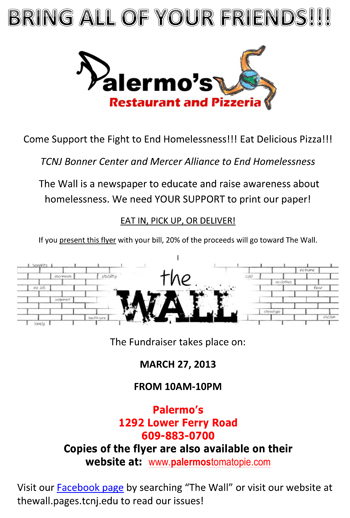 If you present this flyer with your bill, 20% of the proceeds will go toward The Wall. Visit our Facebook page by searching “The Wall” or visit our website at thewall.pages.tcnj.edu to read our issues!